DERBYSHIRE LONG BARN NOW OUT OF THE GROUND! It will be finished in soft red brick with clay tiles with a good amount of exposed oak frame which will weather to a natural silver. A classic combination which will look fantastic when finished. Another succesful project for PJT Design and our friends at Oakwrights! 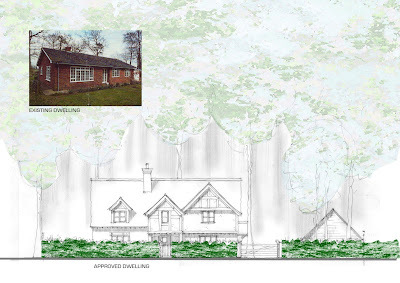 ESSEX PLANNING PASSED – A TRUE DREAM PROJECT! We were delighted to even get involved on this job in the first place. It is a replacement dwelling situation in a great rural Essex village and is located facing the village green and the River Cam so to say this was always going to be a difficult one is an understatement! The clients had some really good ideas on what they wanted to achieve and with the help of PJT Design, we have created what will truly be one of the best houses in the locality. A very bespoke design has been produced because not only did the clients have high expectations but also the existing dwelling is in a conservation area which in terms of policy means that it will always be difficult to justify its replacement. 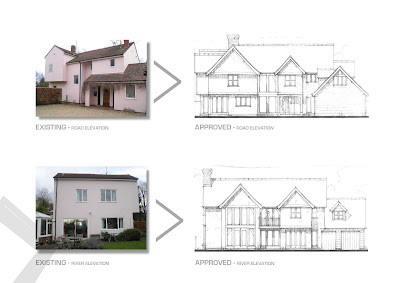 We worked closely with Uttlesford Distrct Council and presented a watertight case in terms of justification for a replacement dwelling and we have officially received full planning approval this week. 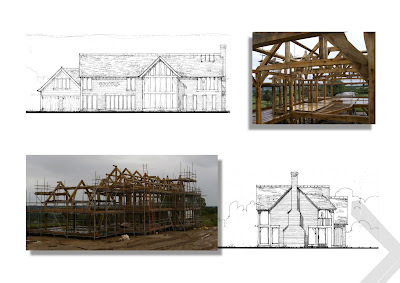 The house is going to be constructed with our good friends at Oakwrights and will feature a full oak frame throughout. This will be a very good looking house when finished and we will be documenting the build process through early 2009 so keep checking back to my blog for further details in coming months. A major result this one….! Have been working with South Cambs Council on this replacement dwelling project for most of this year and we received full planning a couple of weeks ago. We have managed to negotiate a good 2 storey house of circa 2500 square feet from what was a much smaller bungalow and the site is also host to a number of very large trees! A big challenge for us but a very succesful outcome with some very happy clients! 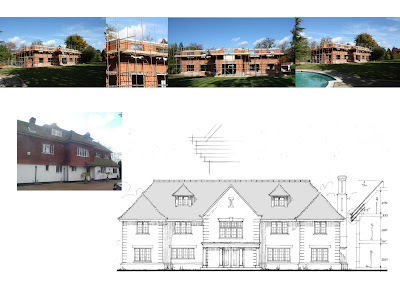 We currently have clients constructing this amazing property in Virginia Water. It is going to be 10,500 square feet when complete comprising accommodation aplenty over 4 floors including the basement. We obtained planning permission for this replacement dwelling earlier in the year and it is scheduled for completion in early 2009. Ascot Project 1 out of the ground! 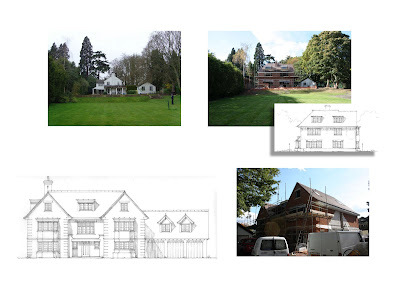 We currently have 2 projects being constructed in Ascot…. This one is 7,500 square feet and has pretty much everything you could wish for! We obtained planning approval for this replacement dwelling earlier in the year and it is scheduled for completion in early 2009. 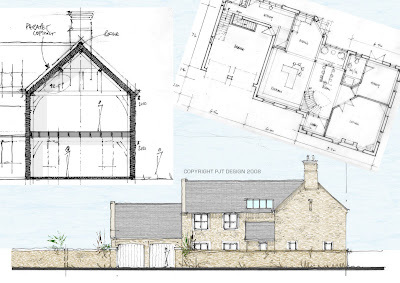 PJT Design worked closely with the client and planners and achieved the necessary permissions to enable this stunning replacement dwelling to be achieved. Great clients, great plot and now….. great house! This project has been a year in the making and has been bespoke designed for some great clients in a wonderful location right on the north coast! A highly sensitive site required our specialist approach and having worked closely with the planners and other associated bodies, PJT DESIGN secured a planning permission as of last night! A great result once more demonstrating the true benefits of bespoke design. December Homebuilding and Renovating Magazine – PJT Design featured article! Check out the December issue for my latest feature article…. It starts at page 76 and explains how to get design right. A must read!